Experiment #17: After completing and seeing your the-minute drawing of a plant, close your eyes and become aware of sensations in the present moment. Then bring your hangs to a new sheet of paper, noticing its presence… touch the paper with a crayon, moving any way it leads you… feel the quality of [the plant’s] life force, noticing any place in you that wakes up. Allow a movement to begin there, trusting its direction. 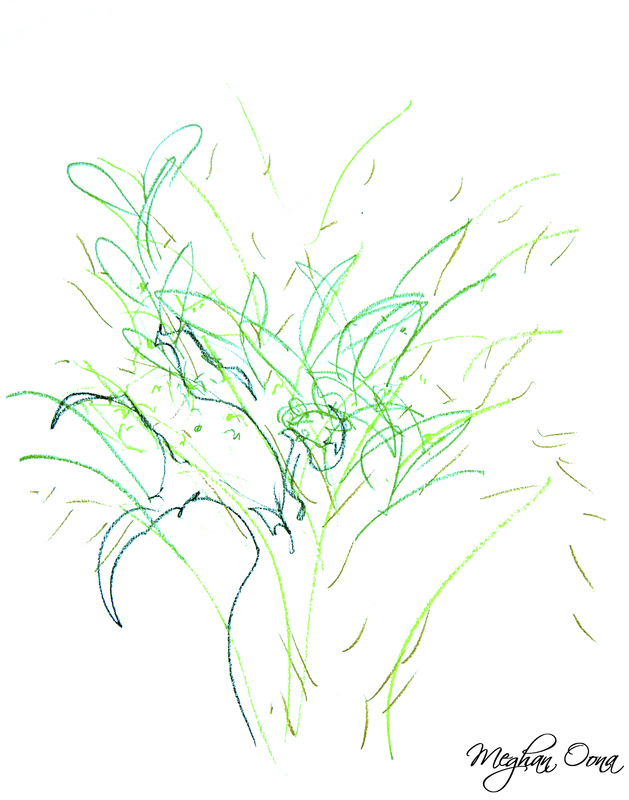 When you have finished, notice the forms that emerged in the drawing, influenced by the plant. So much feeling! Blooming, blossoming, growing, expanding… This piece, with eyes closed, turned out so much more alive and vibrant than the practiced study before. I poured energy into it, thinking of the way the flowers burst outward, and the leaves reached for the light.